Get rid of coal and invest in more nuclear? Idiotic! Oh, how you seem to have changed your tune since falling out with your Plaid pals. Don't be silly, 20:07, I didn't say anything about investing more in nuclear. Wales doesn't need to invest anything at all in nuclear because we can produce more than all the electricity we consume from renewables. Michael wouldn't have fallen out with Plaid if Plaid's leadership hadn't tried to change the party's policy on nuclear over the heads of the membership. Thing is though, coal fired power stations can guarantee a base load coverage. Gas can also do this. Nuclear can too. Renewables can't. True, looking at the annual power consumed, and comparing that to the power generated by renewables, (also the potential we have in Wales), it is mathematically the case of "yes, we can generate more power than we use". But it's also a question of base load and peak load. Don't get me wrong, I'm all for maximising the utilisation of renewables, but the power generated is not always at the same time as the peak load. The traditional method was to use coal for base load and gas for peak coverage, as gas fired power stations can be swtiched on and off within a short space of time. Due to their nature, coal fired TPP can't. They have to be constantly fired, hence their utilsation for the base load. Now, to increase the utilisation of renewables would add to the "mix" of the base load, hence reducing the reliance on coal TPP, but not eliminating it. Also renewables can be used conservatively in the mix for peak loading, but again, due to their lack of reliability, only to a small extent. Hence gas TPP. Nuclear on the other hand can do both. Cover base load AND peak load. But then you have the problem with emissions, and the waste. With coal too, but the emissons can largely be seen, and the waste utilisted in the contruction industry. Waste to Energy is an option that is rarely looked at. There is a constant supply of fuel, and with modern technology, the emissions of nasties can be almost eliminated. The most sensible option of all is simply to use less electricity. With most basic refurbishment works on a semi detached house, the pay-back period is normally between 7-10 years. Forget replacement of windows, and using energy saving bulbs, they are simply marketing ploys. With a handful of simple measures, a house built in the 70s can reduce its power consumption by 30%. When countries such as Kosovo and Montenegro are investing in this sector, it's embarrassing to see your own country limping behind. Thanks 22:23. Quite a few points; most of which make sense, but some don't. The idea of base load and peak load is, to use you word, the "traditional" way of looking at things. With greater use of renewables, the way we look at things has to change. In the absence of large-scale ways of storing electricity (something which is likely to change in future) the way to incorporate new renewables such as wind, solar and tide is to accept that they are intermittent, use them fully when they are available, and then rely on other forms of power to fill in the gaps when necessary. The first and best way of filling the gaps is by hydro (renewable but not "new" renewable) which can be online in seconds, and second to that is gas which can be online in minutes (bear in mind that a proportion of this gas can be produced from organic waste and sewage). Coal takes hours and nuclear takes days. This is why coal and nuclear don't fit well with renewables. You are therefore wrong to say that nuclear can cover both base and peak load. Nuclear is terrible at handing peaks, in fact it is by far the least flexible of all ways of generating electricity. In the short-term I see the way forward as continued development of renewables, but using gas as back up when necessary. How necessary it is depends on the variety of renewable sources and the size of the grid. Grid connexions to Ireland, the continent and Scandinavia (perhaps even Iceland) make the need for fossil fuel back up that much less. Using gas as back up is particularly good in a Welsh context because we have several new gas-fired power stations. This means we have all the capacity we will need, but will definitely not need to run these gas-fired plants all the time. We will simply use them less and less as the proportion of energy from renewables increases. Waste to energy is OK, but it is only one stage better than burying waste in landfill. I'd rather see a greater emphasis on anaerobic digestion of organic waste to produce methane, and recycling other waste. The big problem with burning waste is that it is hard to eliminate the "nasties" because you never know exactly what the waste will contain, and can only capture the things you specifically set out to capture. Of course I agree with you on the need to reduce electricity consumption, but wouldn't dismiss better windows and low energy lighting so readily. In terms of energy, replacing single glazed windows with sealed double glazing is the best investment anyone could make. But this is more likely to save money on your heating bill, which won't necessarily be your electricity bill. One of the saddest indictments of the Welsh government is that it caved in to the mass housebuilding industry and relaxed the new building regulation energy requirements. That was almost criminal. But, that said, an awful lot still needs to be done to improve the existing building stock. I would also say that our use of electricity is almost certain to increase over the next couple of decades, despite any measures we take to reduce our current consumption. This is because we will use much more electricity for transport (rail and car), and it is a good thing because it will displace the use of fossil fuels ... depending, of course, on how much of the additional electricity we produce is from renewables. Plaid's leaders are now free to tell whatever lies they like about their policy on nuclear without it being any of my concern, Gwyn. I'll stick with what I believe regardless of what they do. What about Germany building NEW coal--fired power plants in order to replace its nuclear plants. That's madness for you. Rather than blowing a billion on a new road to England wouldn't it be better to actually build a Welsh energy grid? The most obvious method of storing power is pumped storage systems, but these are being looked at all over Europe (from the Black Forest in Germany, to Bosnia and Bulgaria) and disgarded as no longer economically viable. R&D is making progress, but I really don't think there will be enough in our life times. In Wales we are lucky to have an abundance of hydropower potential. My personal opinion is that we (as in Welsh Govt) should be looking at promoting micro, mini and small HP systems. Thus streets and villages will be able to generate their own power. The ideal model is the "Stadtwerke" cooperative system in Germany. Stuttgart for example has just bought back its own network from EnBW. We don't need big schemes, but we do need a national plan of HP potential. In my experience, nuclear can cover base and peak load. The rods are simply lowered to generate more power, and raised to produce less. However, Nuclear is not something that we should be looking at in Wales. We simply do not need it, and the jobs created will be low paid, unskilled ones. Waste must be recycled, and should be regarded as a resource, rather than a problem. However, no matter how much can be recycled or treated 8whether primary, secondary or tertiary), you still have a residue that is too toxic to send to landfill. Incineration reduces the volume, and turns the waste into a largely inert slag, which can then be landfilled. Double glazed windows are now old hat. State of the Art is triple glazed, with Argon filling between the panes. On the middle pane there is a transparent foil screen which both blocks direct sunlight, and also generates PV power. However, the payback period of these windows is 30+ years , making them unviable except for environmental techies. Bear in mind that the usefull life of windows is estimated at 20-25 years. This in turn also means that for standard triple glazed windows with a payback period of 20 years are on the limit of econimic viability. Energy saving bulbs are so full of toxic chemicals - mostly mercury - that I can only advise against them. They are classified as toxic waste! LED are coming down in price, and are now feasible. As a lot of people use electricity for heating, the two go hand in hand. If the government really wanted to make a stand, then small, decentralised CHP - fired either by gas or biomass - are the way forward, coupled with district heating networks. This would be a far better investment for the whole of Wales, rather than an M4 expansion. I am now mid 40s, from North West Wales, and have never once in my life ever been anywhere near Newport, nor even used the Severn Bridges. The decision to built new coal-fired plants in Germany is somewhat disappointing, 00:32. Germany’s increase in coal burning has been criticized by supporters of nuclear energy because Germany opted to phase out all nuclear power after the Fukushima disaster. The report shows that the electricity generation lost from the closed nuclear plants (43 TWh from 2010-2013) was more than compensated for by the increase in renewable electricity (47 TWh 2010-2103). So the loss of electricity from nuclear has been more than made up for by the increase in electricity from renewables. To put things into perspective using the universally recognized "size of Wales" unit, 43 TWh is about twice the electricity consumed in Wales. What has happened is that, in many places in the EU, more electricity has been generated by coal because it has become cheaper to use coal than gas. One of the reasons for this is that the EU's carbon price scheme is not set at a realistic level, and the second is that no financial price has been set against coal's other emissions. This is what needs to change and this is the main thrusts of the report. 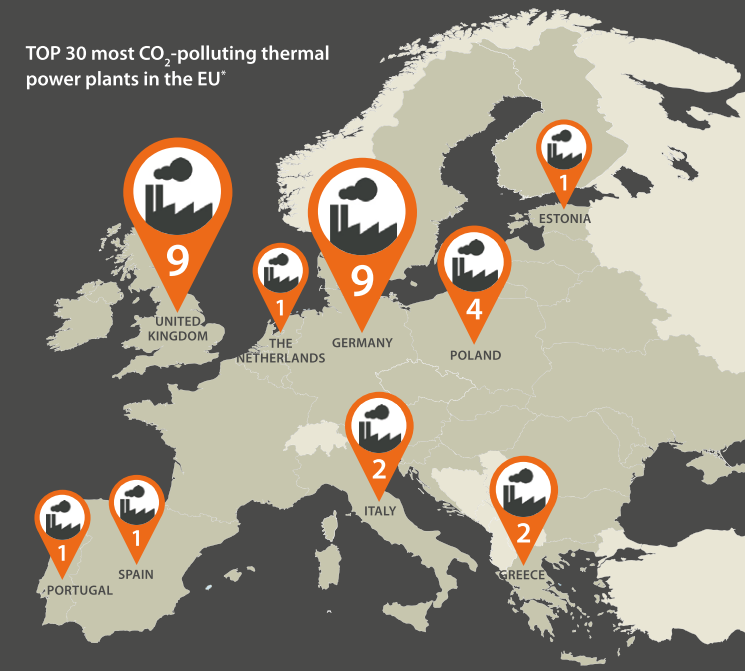 However there is very little sign of the EU toughening up, and the decision by RWE and Vattenfall to build these new coal-fired plants in Germany s a reflection of the fact that these companies don't think the EU probably will do anything to change this anytime soon, as it's hard to imagine them having a life of less than 20 years. That's the tragedy. Building almost anything would be better than the new M4 proposal, Stu. But yes, we definitely need better grid connexions between north and south. However we might get this, as there are plans for an undersea connector between Môn and Pembroke to accommodate the proposed large windfarms (Rhiannon is the first of three) in the Irish Sea Zone just north of Môn. Thanks for your comment, Penderyn. For you to say that pumped storage is "no longer economically viable" is rather sweeping and probably far-fetched. You'd need to back up such statements with some evidence. I agree that Wales has potential for lots of small scale run-of-the-stream hydro, and we should develop this as well as developing other renewables. But it won't solve the problem of storage. One point I have made before and will repeat here is that we should change the way we use the hydro we have, so that instead of it generating a constant low level of energy every day, we use it "on demand" to make up for the intermittency of other renewables. This will involve installing more or bigger turbines, but without changing the capacity of the reservoir. Fully agree with you about the Stadtwerke model. If you haven't already done so, I'd highly recommend that you (and others) read Repossessing the Future from the Jimmy Reid Foundation. Some good ideas. in reality, the output from nuclear in France over a typical week barely changes at all. The variation is mostly provided by hydro. Nuclear is a bad back up for any country which expects to generate most of its electricity from renewables, such as Wales. It cannot be used to fill in any gaps due to intermittency in renewables because although a reactor can be shut down quickly (as would be necessary in an emergency) restarting it again afterwards is not so straightforward, largely for safety reasons. It can be done maybe a hundred times a year, or every three or four days on average. On waste, the key phrase you used is "too toxic". That is why it is not a good idea to burn it, because those toxins would then be released when the waste is burned, and there is no guarantee that these would all be captured. Incineration is one step better than landfill, but only one step. See this post for what I see as a far better way of dealing with waste. By calling double glazed windows "old hat" I think you fail to appreciate just how much of Wales' existing housing stock needs to be improved. MH: I work for one of Germanys largest engineering consultancies, specialising in the Energy sector. Myself, I'm a Chartered Civil Engineer, qualified to issue Energy Passes for buildings, prepare and sign off detailed Energy Audits. I am responsible for our business operations in Southern, Central and Eastern Europe. I have been involved in the preparation of numerous Feasibility Studies for Pumped Storage plants, paid for by well known international Utilities, such as the 2 you named, as well as others. The project in the Black Forest was cancelled, one project in Bulgaria and another in Bosnia were not followed up due to the risk of volatile feed in tariffs and subventions, making the ventures commercially unfeasible. More recently (last year) I was involved in the design of 3 of the 10 Waste to Energy Plant that were put out to tender in Poland. With the right technology - which doesnt come cheap - the potential of WtE must not be ignored. As I said previously, not only for generating electricity, but also heat, which can be provided to homes. This contributes to an enormous reduction in the Primary Energy consumption. Having evaluated numerous buildings; residential, commercial; industrial and public, in countries such as Kosovo, Albania, Montnegro, Ukraine and Moldova, and also taking on ownership of my parents house in North Wales. The house was build by my great, great grandfather in 1908, and i have just renovated it. I think I am in a good position to compare the building substance. More than the housing stock of Wales, the people making the policies need a basic education of what they are actually dealing with. Failing that, they need to pull in experts who know what they are talking about, and these people cost. A lot. On the subject of WtE - it is a very sensitive one, as people, dont want their waste disposed anywhere near where they live. As your previous post from March 2010 states, the ideal option is to reduce the waste produced, then recycle what is left. Ideal, yes, but not completely practical. Germany is probably one of the countries at the top of the list as far as recycling goes. I have 5 bins: Paper, glass, "bio" - i.e. food waste, packaging and residual. We pay for each of these to be collected and disposed of. All are "recycled" by various francised companies, all except residual, which is collected and brought to the city owned incinerator, which provides electricity and heat (district heating) for a significant part of the city. The emissions from the incinerator a minimal, as scrubbers (deNOx, deSOx, etc) have been recently installed. The incineration temperature ust be approx 800C to safely combust all toxins and other nasties, to that the remaining slag can be sent to landfill. However, the residual waste has such a low calorific value, the required temp of 800C cannot be reached. So the francise responsible has to buy in other waste, i.e. packaging, with a high hydro-carbon proportion, so that the required temp can be reached. The costs for buying this additional "fuel" are then passed onto the consumer, so we are effectively paying twice to have our recylced waste disposed of. But Joe Public has a clean concience, as he doesnt care what happens once the waste is collected, so long as he has recycled. What needs to be done is to reduce waste at source. If its not produced, it doesnt need to be disposed of. I would say that the main factor in the feasibility of any pumped hydro scheme is topography. The ability to form a large upper reservoir and the difference in height between it and the lower reservoir outweigh all other factors. The current proposal for Glyn Rhonwy (see here) seems to be perfectly viable. So does Lochaber in Scotland. One of my pet projects is to transform the way the Elan Valley reservoirs work so as to enable pumped hydro between them without in any way compromising their existing purpose, which is to supply water for Birmingham. I guess that falls under the line "also investigating the possible use of potable water reservoirs for pumped storage" on page 2 of my first link. The first paragraph of your 17:29 comment completely misrepresents what I actually said. I suggest you read it again. "The planned PS power plant in the Black forest is not viable. Pumped storage power plant are central to the "Energy Reform" - but at present they are not viable. RWE are withdrawing fro the planned project in Atdorf. ENBW will continue alone for the time being." Thanks for the link, Penderyn. So one specific project stalls. Fair enough. But that doesn't justify your original statement that pumped hydro was being disregarded as no longer economically viable all over Europe. MH, here's a paper that attempts to incorporate the additional costs of different energy generation methods http://www.slideshare.net/daveclubb/leveling-the-playing-field-the-economics-of-electricity-generation-in-europe There are other papers out there; the message is similar. Once you incorporate costs associated with pollution, water use, risk underwriting, merit order, fuel cost vulnerability, balancing costs etc., then renewables - even in 2005 - were better value than fossil fuels. By now the equation will be much more skewed in favour of renewables. Thanks, Gareth. I've read through it and it is very interesting. It makes the bad news about Centrica/Dong's decision to pull out of the Rhiannon windfarm (and the Crown Estate's decision not to re-tender the Irish Sea Zone) into a major tragedy. Without this and the Altantic Array, Wales is left with no Round 3 offshore windframs, and therefore with no immediate opportunity to be the major renewable energy producer we should be. If you're Gareth Clubb, I think you made that point yourself on the news last week.